The Fiat Group has launched MultiAir, a breakthrough in petrol engine design that is claimed to dramatically cut fuel consumption, significantly boost power and torque, and reduce carbon dioxide emissions by between 10 and 25 per cent. Some other engine pollutants are said to be reduced by up to 60 per cent. 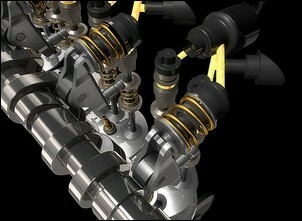 The technology utilises a simple technique that results in a variable relationship between the camshaft lobe shape and the opening of the engine valves. Maximum power is increased by up to 10 per cent thanks to the adoption of a power-orientated mechanical camshaft profile. 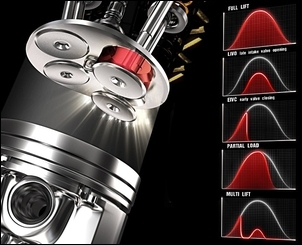 Low RPM torque is improved by up to 15 per cent through early intake valve closing strategies that maximise the air mass trapped in the cylinders. Elimination of pumping losses brings a 10 per cent reduction in fuel consumption and CO2 emissions, both in naturally aspirated and turbocharged engines with the same displacement. Optimum valve control strategies during engine warm-up and internal exhaust gas recirculation, realised by reopening the intake valves during the exhaust stroke, result in emissions reductions ranging from 40 per cent for unburnt hydrocarbons and carbon monoxide (HC/CO), and up to a 60 per cent cut in oxides of nitrogen, (NOx). Constant upstream air pressure, atmospheric for naturally aspirated and higher for turbocharged engines, together with extremely fast air mass control, cylinder-by-cylinder and stroke-by-stroke, result in a superior dynamic engine response. MultiAir is applicable to all internal combustion engines, regardless of the fuel used. It can be adapted for diesel engines to reduce their NOx emissions and make particulate filters significantly more effective. The first new engine equipped with MultiAir is the 16-valve 1.4 litre family of naturally aspirated and turbocharged engines. Its second application will be as an integral part of a new two cylinder engine family. The breakthrough is based on direct air charge metering at the cylinder inlet ports by means of advanced electronic actuation and control of the intake valves, while maintaining a constant natural upstream pressure. Research on this key technology started in the ’80s, when engine electronic control reached the stage of a mature technology. At the outset, world-wide research efforts were focused on the electromagnetic actuation concept, where valve opening and closing is obtained by alternatively energising upper and lower magnets with an armature connected to the valve. This actuating principle had the intrinsic appeal of maximum flexibility and dynamic response in valve control, but despite a decade of significant development efforts, the main drawbacks of the concept – it being intrinsically not fail-safe and its high energy absorption – could not be fully overcome. At this point most automotive companies fell back on the development of the simpler, robust and well-known electromechanical concepts, based on valve lift variation through dedicated mechanisms, usually combined with camshaft phasers to allow control of both valve lift and phase. The main limitation of these systems is low flexibility in valve opening schedules and a much lower dynamic response; for example, all the cylinders of an engine bank are actuated simultaneously, thereby excluding any cylinder-selective actions. Many similar electromechanical valve control systems were subsequently introduced over the past decade. In the mid ’90s, Fiat Group research efforts switched to electro-hydraulic actuation. The goal was to reach the desired flexibility of air mass control on a cylinder-by-cylinder and stroke-by-stroke basis. The electro-hydraulic variable valve actuation technology developed by Fiat was selected for its relative simplicity, low power requirements, intrinsic fail-safe nature and low cost potential. 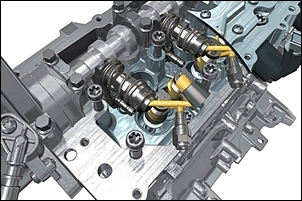 The operating principle of the system, applied to intake valves, is the following: a piston, moved by a mechanical intake camshaft, is connected to the intake valve through a hydraulic chamber, which is controlled by a normally open on/off solenoid valve. When the solenoid valve is closed, the oil in the hydraulic chamber behaves like a solid body and transmits to the intake valves the lift schedule imposed by the mechanical intake camshaft. When the solenoid valve is open, the hydraulic chamber and the intake valves are de-coupled; the intake valves do not follow the intake camshaft anymore and close under the valve spring action. To ensure a soft and regular landing phase in any engine operating conditions, the final part of the valve closing stroke is controlled by a dedicated hydraulic brake. For maximum power, the solenoid valve is always closed and full valve opening is achieved following completely the mechanical camshaft, which is specifically designed to maximise power at high engine speed (long opening time). For low-rpm torque, the solenoid valve is opened near the end of the camshaft profile, leading to early intake valve closing. This eliminates unwanted backflow into the manifold and maximises the air mass trapped in the cylinders. In engine part-load, the solenoid valve is opened earlier, causing partial valve openings to control the trapped air mass as a function of the required torque. 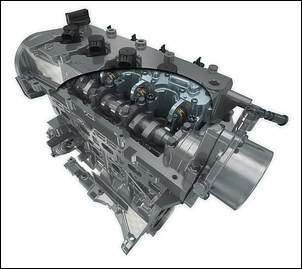 Alternatively the intake valves can be partially opened by closing the solenoid valve once the mechanical camshaft action has already started. In this case the air stream into the cylinder is faster and results in higher in-cylinder turbulence. The last two actuation modes can be combined in the same intake stroke, generating a so-called Multilift mode that enhances turbulence and combustion rate at very low loads. Integration of the MultiAir Direct air mass control with Direct petrol Injection to further improve transient response and fuel economy. Introduction of more advanced multiple valve opening strategies to further reduce emissions. Innovative engine-turbocharger matching to control trapped air mass through a combination of optimum boost pressure and valve opening strategies. 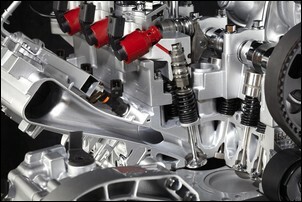 MultiAir Electronic Valve Control technology can be applied to all internal combustion engines, whatever fuel they burn. MultiAir, initially developed for spark ignition engines burning light fuel ranging from petrol to natural gas and hydrogen, also has wide potential for diesel engine emissions reduction. 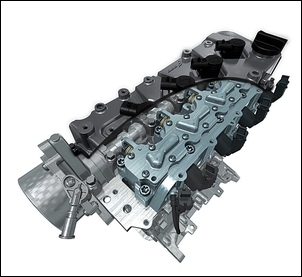 Intrinsic NOx reduction of up to 60 per cent can be obtained by internal exhaust gas recirculation (iEGR) realised with intake valves reopening during the exhaust stroke, while optimal valve control strategies during cold start and warm-up bring up to 40 per cent HC and CO reduction of emissions. Further substantial reductions come from the more efficient management and regeneration of the diesel particulate filter and NOx storage catalyst, thanks to the highly dynamic air mass flow control during transient engine operation.